If there’s one thing that will never change about the group of people that make up Modern Family, it’s that they’re all deeply insecure. That’s not a bad thing though. Part of being human is harboring unkind thoughts towards ourselves, and if my 31 years in this world is any indication, that never really changes. You have your good and bad moments, sure, but sometimes there’s just those insecurities that are impossible to shake. They’re part of who you are, and you just learn to live with them. “Stand By Your Man” is all about insecure individuals, and how no amount of time passed or love exchanged can change that kind of mindset. That might sound dour, but it’s kind of sweet. Putting Haley’s pregnancy on hold for a bit, the show decides to focus on the characters who’ve been rather tertiary this season. We get Phil’s feelings about being a role model for his growing family, a rare appearance from Bill and Luke, and another iteration of Mitchell and Cam failing to feel comfortable in their relationship. Each storyline has its strengths and weaknesses, but the episode as a whole feels like a worthwhile pit stop before the inevitable arrival of Haley and Dylan’s twins. Let’s start with the most underwhelming storyline, which involves Mitchell and Cam. The former has forgotten their anniversary, and that means he’s about to spend a lot of time trying to make up for it. Cam is about to embark on one of his line dancing nights, so Mitchell buys him a fancy new belt buckle adorned with a Texas Longhorn, and then sensing that Cam still isn’t happy, shows up at the country bar draped in cheesy cowboy apparel. The predictable follows: Mitchell proves to be an embarrassment, fumbling the line dancing and the Beer Derby when he can’t chug worth a damn. Cam has to admit that while he’s always wanted him there, the real thing proves to be a bummer. It’s a perfectly fine storyline. Cam and Mitchell come to an understanding about not feeling pressured to do things they don’t want to, and understanding that it doesn’t signal a lost spark in their relationship, but it’s also something we’ve seen many times before. Modern Family loves to remind us that Cam and Mitchell come from very different backgrounds and have different interests. Within the grander theme of this week’s episode, this is the familiar, dud of a story. Side note: Okay, maybe the real dud of the week is Gloria’s attempts to sabotage Jay’s new business venture, which involves selling dog beds, but I can’t even tell anymore because I’m just completely done with everything involving Jay and Gloria. The show has no idea how to tell an interesting story with them. Every single episode is either an empty exploration involving Jay’s age and transition out of the business world, or reliant on Gloria being nothing but a stereotype. Add in a character like Manny who never changes, and a character like Joe who’s there for reasons I can’t explain, and you have a consistent mess. Alright, back to it. The other two storylines from this week are a bit more promising. What’s interesting is that “Stand By Your Man” doesn’t get the ball rolling on a Lily and Claire story until halfway through the episode, when we learn she’s babysitting so that Mitchell can go embarrass himself. It’s an arrangement that worries Cam, because Lily and Claire never talk to each other. 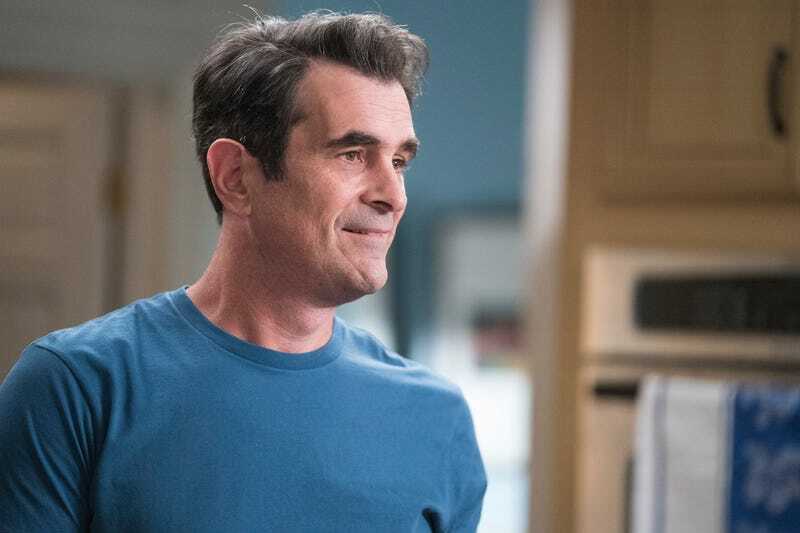 That setup makes way for something that doesn’t quite make up for the way the show just puts Lily on the sidelines, but does offer up something emotionally substantial. Clair and Lily initially bond over Lily thinking her aunt is cool, before Claire has to cut through the nonsense and speak the truth about being uncool. Essentially, they reenact the Lester Bangs and William Miller conversation from Almost Famous, and it’s pretty delightful. That brings us to the best part of the episode, which is Phil failing in his attempt to bond with and impress Luke, Dylan, and Bill. He tries to have them over for an MMA fight, but accidentally orders Mamma Mia! instead. He tries to pivot and show them The Karate Kid as a way to impart wisdom, but only suffers through the unbearable trolling commentary of these millenials instead. There’s no winning, or at least that’s what he thinks. Again, this is all rather predictable, but it hits a lot of the right notes. When Phil locks himself in his room and tells the guys that he’s sad that he can’t be a role model for them, they all run down the ways that he’s incredible. He’s a good father, a good magician, and he has a lot of wisdom to offer. There’s nothing particularly new and exciting here, but this is an episode that packs enough of an emotional punch as we inch closer to the end of the season.